That might be a little harsh! Yes, I had to reject some striped octagon blocks from a project because I wasn't paying attention when I printed templates. I accidentally printed a batch that was smaller and didn't realize it until it was all said and done. A reject could be the result of size, color or design of a block. It just means it's rejected from a specific project, but can easily be transformed and reconfigured in to something else! I'm not sure why I call this 'OctoMama', it must be a term of endearment or a little nickname that stuck! But this...is what can not be called a reject any longer! Most of these English Paper Pieced Striped Octagons were finished, with the exception of outside 'partial' blocks. When I was brainstorming on what to do in the beginning, I had an idea of having the blocks fade around the edges. I made a few more EPP blocks with a lighter shade of color for the stripe surrounded with white. Which I kind of liked! Then I added a few small blocks scattered around for a little more interest. 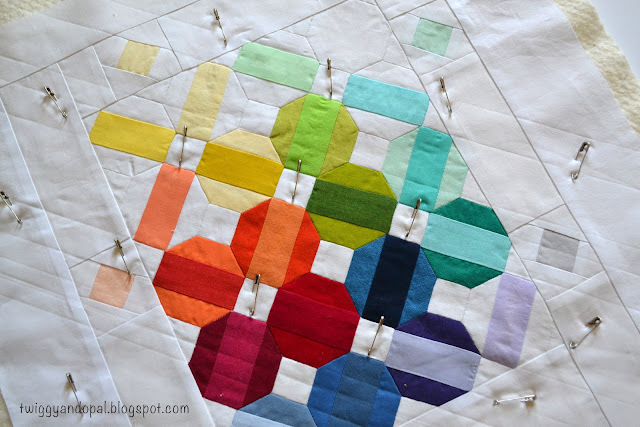 Before I knew it I was quilting octagons and not very perfect either! I started it, I had to finish it! They weren't too bad to quilt, just slow going. After getting feedback on thread color in a previous post, variegated thread was mentioned several times. I happened to have a pastel spool on hand and decided to give it a try. If I like it...I'll buy a big spool. And I like it. And it blends! It doesn't stand out on the darker colors and all but disappears on the white. I quilted an octagon in the center using 1/4" lines and then switched to 1/2" around the outside. You probably noticed the two shades of white. We all know how that goes...not all shades of white are equal! The photo makes it very noticeable, but real life...it isn't that bad! 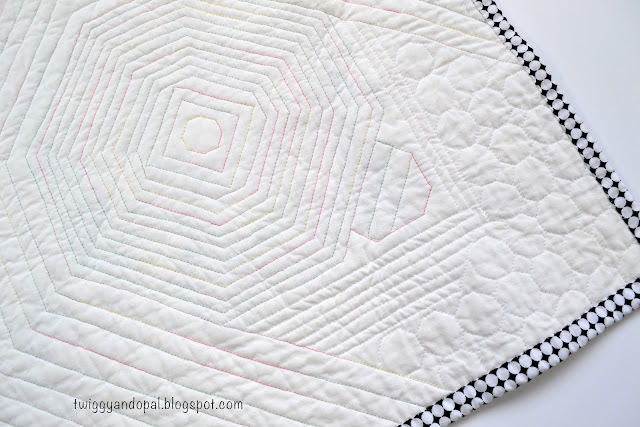 A funky concoction of quilting, thread ad binding! Love that Octo quilting! I thought it looked time consuming before I read what you said about it, but it looks great. I had the exact experience with two whites. It really showed up in the pics and I hadn't even noticed before. Great job! I tried to keep my whites matched, but not too successfully! It can be hard to see the subtle differences. Maybe I should take a photo of the whites before I put them in a project if I’m trying to match…never thought of that!! Very cool! And I love the 2 shades of white. I've done that on purpose before and like it. 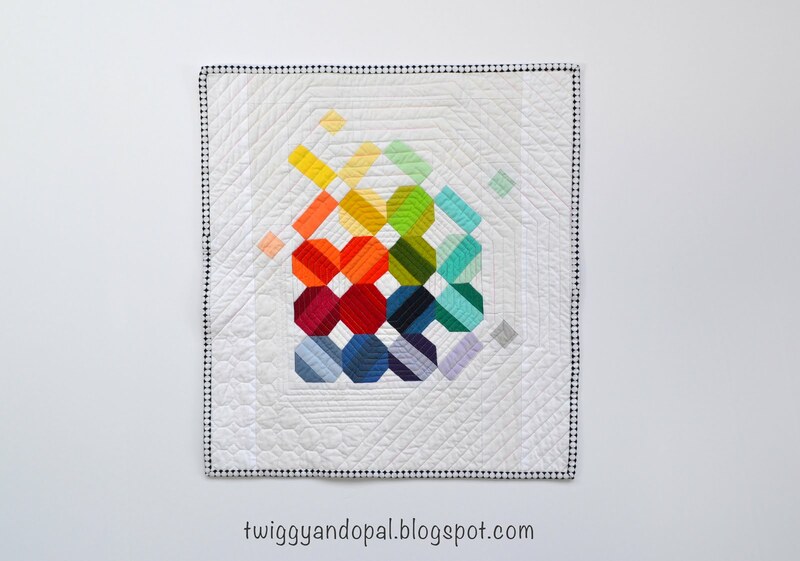 I'm glad you liked the variegated thread! 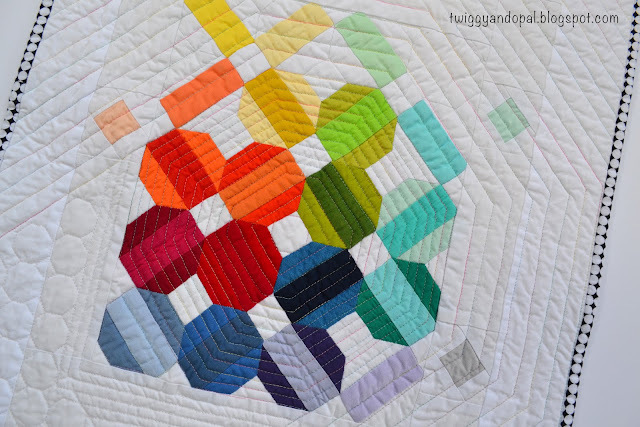 :) The shapes and quilting have my brain trying to convince my eyes that the binding print is made of octagons as well - fun optical illusion! This is so cool Jayne ! And I like very much that you used two shades of white. It really adds something to your design. I really have a hard time letting pieces/blocks sit unclaimed! I’ve been known to make 2, 3 or 4 projects until ever piece is used up! Cute! I would have thought that the two shades were intentional if you hadn't mentioned it! Sweet mini and no hint of a reject there now at all! Jayne! Here you go again, making something so danged COOL!!! I love this - really LOVE it! A great use of "rejects", Jayne. Love this quilt! Very cute! I like the variegated thread you used with its subtle changes in color. So cute Jayne - wonderful use of the 'reject' blocks. 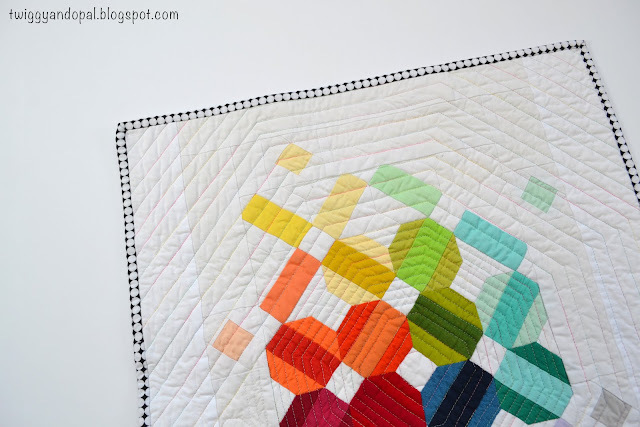 My favorite aspect of this project is the angled straight line quilting used in conjunction with the hexie FMQ. This is so cool - nothing reject about it, for sure. :) I thought the second white was an on purpose design choice! 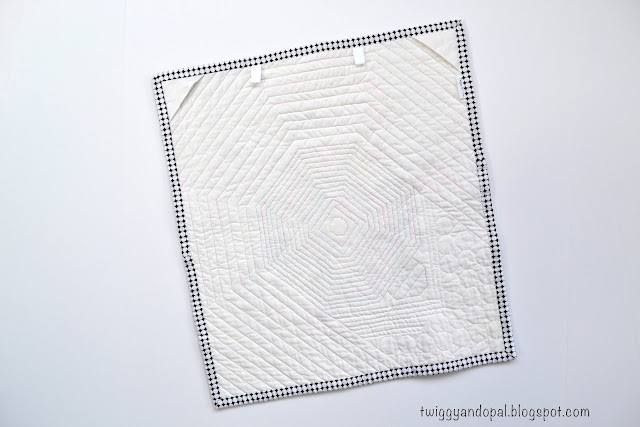 Great project, your quilting design is just wonderful. I love everything about it, especially the octoquilting! You would never know this mini is from the "rejected ". Great job making something beautiful from them. Thanks for sharing with Oh Scrap! Great job! love the quilting and all. I love, love, love it. Thanks for sharing some of your thought processes too. It truly looks like you planned it in advance. The fading out of the blocks was a real inspiration, and I thought that the two whites were a frame effect. 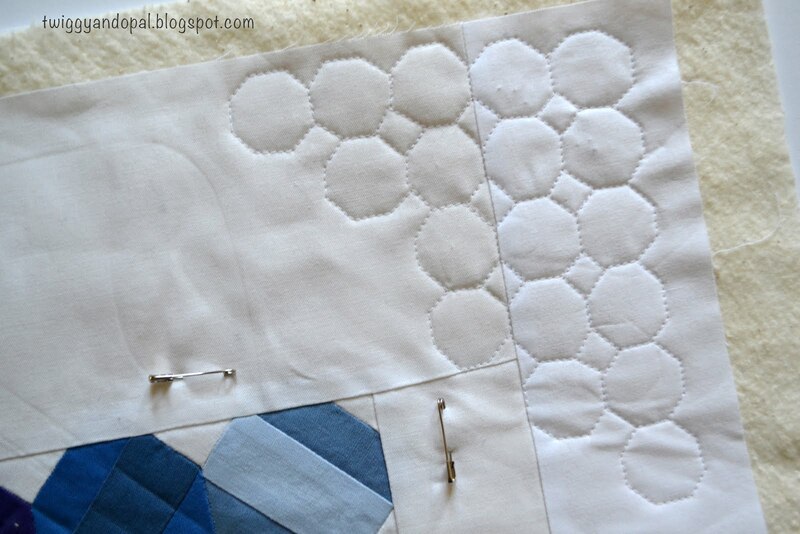 The quilting is excellent and really nuances the design. Can't believe those were rejects! Cute little finish. I always love variegated thread and the quilted octos are a fun touch. From a "reject" to an interesting piece of art. Nice work. Great save for the blocks. A wonderful little finish.